Obama inauguration speech: President brings God into climate change fight. 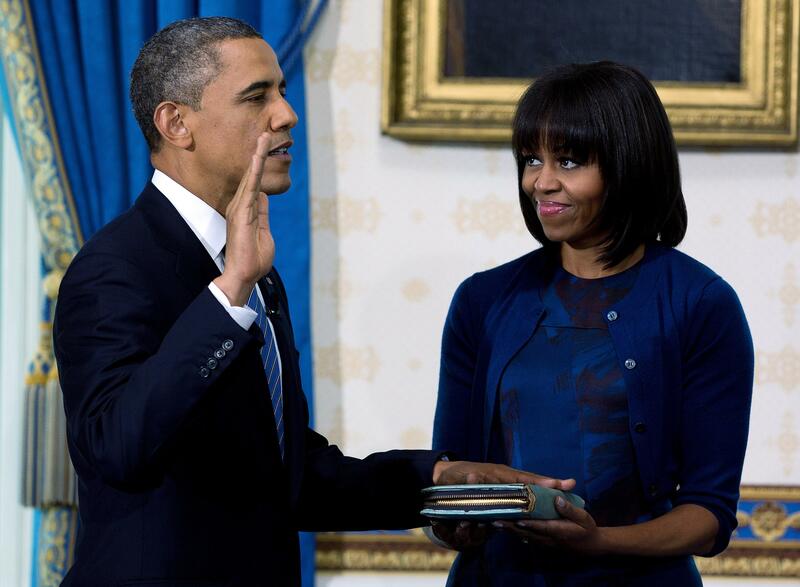 Barack Obama takes the oath of office as first lady Michelle Obama holds the Bible. Climate change and environmental policy have always been on President Obama’s agenda. But rarely have they been so central as they were in his inaugural address on Monday, when the environment was the first issue Obama brought up after his full-throated defense of economic fairness. If Obama were just paying lip service to climate change to please his backers on the left—as he has sometimes been accused of doing—the reference to “science” would have been quite sufficient. By bringing in God, he’s attempting to reframe the issue as one that transcends not only partisanship but the divide between those who believe in science and those who doubt science but believe in God. Left or right, atheist or creationist—either way, Obama is saying, we’ve got to do something.